Fillings are a common dental tool used to restore teeth that are damaged from cavities and decay and prevent any further damage. If it is recommended that you rectify a cavity with a filling, you will have lots of options to choose from. These options all have various pros and cons of the material used to cost. It is important that work with a dental professional that will take the time to explain your options and listen to your needs and preferences. If you have a cavity and need a filling, here’s what to expect. You will need to schedule an appointment that will take about an hour. During this time, a numbing agent will be applied to alleviate any possible discomfort. The cavity and decay will be removed from the tooth using a drill. Once the decay has been removed your dental team will place a filling to restore the tooth and prevent any further damage. There are now a wide variety of fillings available. The best choice for you will depend on the extent and location of the tooth decay as well as your preferences regarding durability and appearance. Amalgam Fillings: Amalgam is defined as a mixture or blend. Amalgam fillings are made up of several different types of metals and are traditionally very strong. Amalgam fillings can be with silver or gold and other metals. Using gold fillings, instead of silver, typically increases the cost substantially. Because they are a mixture of strong metals, amalgam fillings are a good choice for teeth that suffer from excess wear and use such as molars. 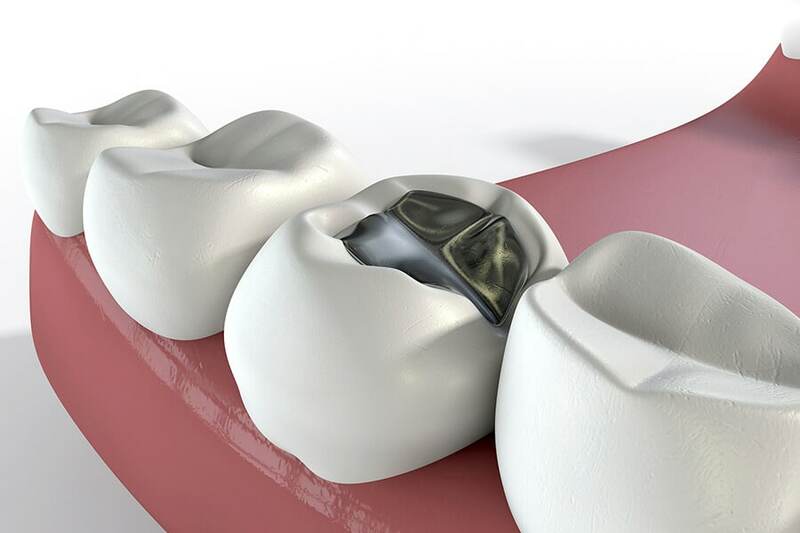 Other benefits to amalgam fillings are their durability, often lasting 10 to 15 years. In addition, silver amalgam fillings may also be less expensive than some of their counterparts. The downside to amalgam fillings is their distinctive color which can make them easily noticeable to others. Composite: If you are self-conscious about your smile, composite fillings may be a better option. Where amalgam fillings easily noticeable, composite fillings can actually be closely matched to your existing tooth color. This means that any fillings you have will not be obvious to others. Composite fillings are applied by chemically bonding them to the tooth making them fairly durable. These types of fillings are ideal for areas in the mouth that have moderate chewing. Composite fillings may be more expensive than traditional silver amalgam. Ceramic: Ceramic fillings are usually made of porcelain and can also be matched to your existing tooth color. The lifespan of ceramic fillings is approximately 15 years. Ceramic is more resistant to staining but can be expensive depending on your insurance coverage and pricing. Glass Ionomer: This type of filling is made of acrylic and forms a chemical link to the tooth. This kind of filling is weaker than its counterparts, with a lifespan of around 5 years. Because of the durability, it is most often recommended for teeth that do not have heavy wear. The benefit of glass ionomer fillings is that there is minimal preparation of the tooth, because the fillings bonds directly to it. With so many filling options, it is important for you to identify your priorities such as appearance or budget and work with your dentist who will assess your logistical needs to find the perfect fit. After you receive a filling you may experience sensitivity to hot or cold. This is normal and should subside after a short period of time. Your gums may also be sensitive. This too should subside. If you feel discomfort biting down or that your bite is not even, contact your dentist. This may be an indication that your filling needs to be adjusted. Depending on the type of filling you choose, you may need to avoid hard foods for the first day or two. Work with your dentist to receive education about how to best care for your new fillings. You need to practice proper oral care to keep your teeth and fillings as healthy as possible. It is important that you take care of your fillings to help them last as long as possible and prevent any further decay. Without good oral hygiene you may have to replace your fillings more quickly and find yourself with additional fillings needed. Even in the best of circumstances, fillings won’t last forever. Contact your dentist immediately if you feel any cracks or damage. The sooner the filling can be replaced the better. We work with our patients to make sure they know all their options. Your oral health needs and personal preferences will guide our recommendation regarding which filling is the perfect fit for you. Our team will also take the time to educate you on how to best maintain your filling and keep your smile healthy and shining.